Best for: All Preperation time: 15 minutes. Caramel Apples recipe by Marium Hamid at DesiRecipes.com. Sieve for sifting sugar, icing . Mix butter and sugar together in a small bowl. 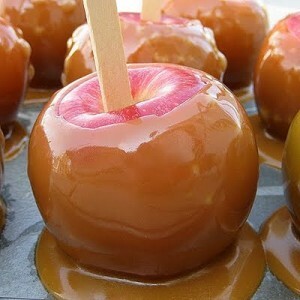 Fill the centre of each apple with the sugar mixture. Put a knob of butter over the filling. Add white grape juice in the bating dish. Bake in oven at 400F, Gas mark 6 for 40-45 minutes or until the apple are quite tender, but firm. Remove the apples from the baking dish and pour the juice in a saucepan. Add the sieved apricot jam. Stir over low heat until well blended. Bring to a boil and simmer for a moment and remove from heat. Carefully remove the paper from each apple and replace them in the baking dish. Sift the top liberally with icing sugar and glaze quickly under hot grill to caramelize the tops. Spoon over the hot apricot glaze and serve hot with cream.